By combining an ergonomically correct press arm and a functional training arm, the P2X puts you in the unique position of having the best of both worlds: traditional exercises as well as functional training in a single, compact machine. Enhance the quality of your workouts with the Powerline P2X Home Gym. The Powerline P2X Home Gym allows you to strengthen every part of your body and helps you to achieve your fitness goals. 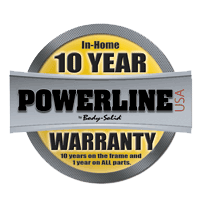 Please feel free to contact one of our fitness specialists at 1-877-336-7483 with any questions you may have about the Powerline P2X Home Gym. Order your Powerline P2X Home Gym from FitnessFactoryOutlet.com today and start your path to good health, physical fitness, and the body you really want. Ab Crunch / Mid Pulley Station: develop awesome abs and terrific triceps quickly at this strength training station. Biomechanically engineered for a smooth, comfortable, full range of motion crunching movement. Specifically designed for firming, flattening and isolating the entire abdominal area. Leg Extension / Leg Curl Station: when you' re ready to build muscular legs and stronger knee joints, this leg developer is ready to help you meet your goals. The leg developer’s SmoothGlide Bearing System combined with the self-aligning leg cuffs guide you through the most demanding leg curls and leg extensions. Optional Leg Press (sold separately): can be mounted on either side of the gym and offers a 2:1 ratio for increased resistance. Powered by a 160 lb Alloy Weight Stack: advanced alloy weight stack plates are machine drilled to exact specifications and employ state-of-the-art nylon bushings for super smooth and quiet operation. Optional 50 lb upgrade also available (sold separately). Dimensions: 83" H x 71" L x 66" W.
Pull your optimum workout together with the Powerline P2X Home Gym with Functional Training Arms. Order your PowerLine P2X Home Gym from FitnessFactoryOutlet.com today!